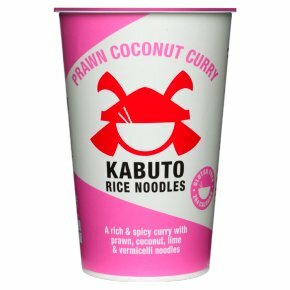 A rich and spicy gluten-free instant noodle curry with vermicelli noodles, prawns, coconut and lime. This dish is completely gluten-free and bursting with flavour. Step 1) Remove lid and fill to fill line with boiling water, replace lid loosely and wait 3-4 minutes (opportunity to meditate or practise your karate) Step 2) Stir well, leave for 1 minute, then enjoy noodles and soup straight from the pot or poured into a bowl (if no bowl available, try upside down helmet) Remember to stir well, for true goodness lies beneath. Beware Samurai, for your noodles will be hot. Make sure you eat them before they get cold and do not reheat. Failure to do so will bring great shame to yourself and your family.